If staffs operating computed tomography (CT) scanners are aware of the level of doses delivered to patients, this can be helpful in optimizing scan protocols. Dose indices are displayed on CT scanner consoles in terms of the volume weighted CT dose index (CTDIvol) and the dose-length product that incorporates the CTDIvol. The CTDIvol is based on output measurements made in standard cylindrical polymethyl methacrylate phantoms ,, and so does not give an accurate indication of how dose varies with patient size. Therefore, the CTDIvol gives a false impression of doses to the organs and tissues of larger relative to smaller patients, because the incident X-rays are attenuated to a greater extent in overlying tissues. The American Association of Physics in Medicine (AAPM) introduced a concept termed the size-specific dose estimate (SSDE) in report No. 204. This is the CTDIvol adjusted for patient size giving a dose parameter that equates to the dose to tissues in the center of the scanned region for patients of any size. The SSDE is calculated by multiplying CTDIvol values from the scan by coefficients relating to patient size. The coefficients take account of the greater attenuation in the tissues of larger patients, so increase as patient size decreases. Current CT scanners incorporate automatic tube current modulation (ATCM) systems to aid in maintaining consistent image quality throughout scans by optimizing the radiation level for tissue attenuation and patients of varying size. In principle, the tube current is adjusted automatically to that appropriate for the X-ray attenuation of the patient cross-section being scanned. The ATCM systems for different CT manufacturers vary in their modes of operation. Those used at present can be divided into two groups, based on different image quality criteria.,, The tube current is adjusted to achieve the reference image quality throughout each scan. The ATCM systems of Toshiba and GE scanners aim to maintain a constant image noise level selected by the operator through varying the tube current within minimum and maximum levels also set by the operator. In contrast, the ATCM systems of Philips and Siemens scanners use an image quality level selected by the operator that is linked to a reference mAs for parts of the patient that have a similar attenuation to that of a reference patient stored by the scanner. This system varies tube current with patient attenuation according to a predetermined relationship and accepts higher noise levels for more attenuating parts of the patient. The objectives of this study were to investigate the relationships between SSDE, CTDIvol, and patient size for two CT scanners with different types of ATCM system, and demonstrate how variations in the displayed dosimetry parameters differ from the actual changes in magnitudes of patient organ doses. This is particularly significant for Asian populations since the stature of a typical adult is substantially different from that of an adult from a western population on which the dimensions of the standard dosimetry phantom is based. Values of the SSDE have been compared with mean absorbed doses for organs fully covered by the primary beam, derived using equations proposed by Turner et al. differences in the manner in which noise levels vary with a patient size between the two scanners have also been studied. Ethical approval was gained from Naresuan University committee (IRB235/59). Two 128 slice CT scanners equipped with ATCM systems were used in the study, a Siemens Definition AS + software version Syngo CT 2012B (Siemens Healthcare) and a GE Optima 660 software version cj2_5 m3sp4.5 (GE Healthcare). Details of the abdomen and pelvis protocols used for all examinations are shown in [Table 1]. The start and stop positions of the scans were the carina and symphysis pubis, respectively. An Adaptive Statistical Iterative Reconstruction (ASIR) level of 20% was used for the GE scanner but only filtered back projection was available on the Siemens scanner. From a previous study on transferring of CT protocols for CT ATCM system, the protocols for both scanners were matched for noise in patients who had cross-sectional areas that approximated to that of the trunk for a large adult Thai patient. The minimum mAs for the GE scanner was set at 80 mAs to restrict modulation that can affect image quality for small patients, and this resulted in the mAs remaining constant throughout scans for some patients, so data for these individuals were excluded from the study. There is no option for users to select the mAs range for the Siemens scanner, because of the mode of operation, as described above. Values of CTDIvol (mGy) were recorded from the scanner displays after the scans. It has been proved that calculation of patient dose using each of CTDIvol per slice along the scan length for ATCM system is quiet similar to that using the average CTDIvol for the whole scan. Tube current time products per image for the entire scan under ATCM control were read out using an Auto-mA plugin and values of average mAs were plotted against patient size. For the Siemens scanner, the mAs was calculated using a multiplication of effective mAs and pitch factor to allow the mAs values for both CT scanners to be compared. Values of SSDE (mGy) were calculated using the AAPM TG 204 conversion factors and the scanner reported CTDIvol from the equation 1. Where is the displayed CTDIvol (mGy) from the scan, and is a factor to convert the CTDIvol for the 32 cm diameter reference phantom to that for a patient with dimension AP + lateral (LAT) (cm) as shown in equation 2. The relationship derived from the equation is shown in [Figure 1]. Since the sum, AP + LAT has been shown to produce less variability in SSDE calculation with respect to measurement position,,, the present study used this to represent patient size. CT images were reviewed to measure the patient anteroposterior (AP) and LAT dimensions in centimeter at the reference level of L1. The slices with the smallest and largest LAT dimensions were used to assess the range in AP + LAT dimensions for each patient which was used to evaluate the percentage uncertainty in SSDE. Where the same anatomic region was scanned multiple times, for example, pre- and post-contrast injections, the CTDIvol was only recorded for the precontrast examination. Image noise in terms of standard deviation in pixel value was measured by placing each of five circular regions of interest of 100 mm 2 within the liver at the level of the mid-point of the liver, and the relationship between the average value of the measured noise and patient size studied. Absorbed doses (mGy) for organs lying fully within the scan volume such as the liver, stomach, and kidney were calculated using equations proposed by Turner et al. These are based on Monte Carlo simulations and use CTDIvol-to-organ-dose conversion coefficients linked to the patient perimeter distance as shown in the equation 3. Where x is the patient perimeter and values of the coefficient A0 are 3.824, 3.780, and 3.969, and of B0 are 0.012, 0.0113, and 0.0124 for the liver, stomach and kidney, respectively. The patient circumference was calculated from the equation 4. Where a and b are the major and minor axes (cm) of the image of the cross-section. Statistical Package for the Social Sciences version 17 was used (SPSS Inc., Chicago, IL, USA) for the project. Relationships in the form of linear regressions between SSDE (mGy), CTDIvol (mGy), organ absorbed dose (mGy), and patient size (cm) were analyzed. Data from 244 patients who had undergone CT examinations of the abdomen and pelvis protocol from the two CT scanners were included in the study (106 patients for the GE scanner and 138 for the Siemens scanner). Descriptive statistics for patient sizes, CTDIvol, and SSDE are given in [Table 2]. Plots of the average mAs values against patient size for both CT scanners are shown in [Figure 2]. The mAs values increased substantially with patient size (r2 = 0.725, P= 0.001) for the GE scanner, while those for the Siemens scanner increased less, the range in mAs was smaller but the data were more scattered (r2 = 0.119, P= 0.001). Plots of CTDIvol and SSDE data against patient size for both CT scanners are shown in [Figure 3] with linear regression fits and since the CTDIvol data are lower this indicates that it underestimates organ dose for almost all patients in the study. The results show a stronger dependence of the CTDIvol and SSDE on patient size for the GE scanner, with both data, fits having similar gradients of 0.53–0.55 mGy/cm, P < 0.001, although the increase in SSDE with patient size will be proportionately less. For the Siemens scanner, the gradient for the CTDIvol was 0.3 mGy/cm (P < 0.001) and that for the SSDE was 0.13 mGy/cm, (P = 0.002), showing that the change in SSDE with patient size was substantially less than indicated by the CTDIvol. Comparing doses for patients with AP + LAT measurements of 65 cm with those for a 45 cm patient, the CTDIvol values increased by factors of 3.7 and 1.6 for the GE and Siemens scanner respectively, but this gives a false impression of the actual differences in dose to the patients' organs. The ratios of the SSDE values for patients with AP + LAT measurements of 65 cm and 45 cm are 2.4 and 1.2 for the GE and Siemens scanners, respectively, showing that the actual differences in doses to the organs of patients of different size are actually much lower as shown in [Table 3]. Changes in the measured noise levels with patient size for both CT scanners are shown in [Figure 4]. For the GE scanner, the SD was 12.0 ± 1.4 HU and there was a small decrease in measured noise with patient size. The SD for the Siemens scanner increased slightly with the patient size and the average value was 10.8 ± 1.7 HU. The magnitudes of the changes in SD with size were similar to or less than the overall scatter in the results. Uncertainties in the SSDE based on differences in the AP + LAT measurement made at different positions within the scan fields were ± 6.2% for both CT scanners. Plots of the absorbed dose for organs covered in the primary beam, which are the liver, the stomach and the kidney, are shown in [Figure 5]. There were strong relationships between the organ absorbed dose and the SSDE for all organs and both CT scanners (values of r2 > 0.99). Multiplication factors to calculate absorbed dose for the liver, the stomach and the kidney from SSDE were 1.03, 0.98, and 1.03 respectively for the GE scanner and 1.03, 0.99, and 0.99, respectively, for the Siemens one. Results suggest that the SSDE reflects doses to organs that lie entirely within the primary beam to within ± 3%. Results in this study were based on the routine protocol for both CT scanners. For the GE scanner, ASIR levels from 10% to 100% can be selected, with noise reduced to a minimum in the 100% ASIR. From literature review, up to 40%, ASIR is considered a good balance between reduced noise and a natural appearance of the image. Since there were over-smoothing, due to aggressive noise reduction, of images with higher strengths of iterative reconstruction, 20% ASIR was set as a default protocol for CT body scans for this GE scanner. Since a minimum mA of 80 mA was set, the mAs remained constant throughout scans of smaller patients. If a higher value of ASIR had been selected, there would have been no change in mA for the group of slightly larger patients at the selected Noise Index (NI) level as shown in [Table 1], and the ASIR would reduce image quantum noise with no impact on radiation dose. If the operator-selected NI is increased, the patient dose may be decreased at the expense of greater image noise. The image contrast for slim patients tends to be lower because there is a limited fat delineation of organ structures. Higher dose levels are implemented for very small patients by capping the minimum mA to limit current modulation and achieve a lower level of image noise improving image quality. Based on a comparison of SSDE and CTDIvol for patients undergoing CT abdomen and pelvis examinations as shown in [Table 2], the CTDIvol displayed on the scanner console underestimated the doses to the organs of the majority of patients by 20%-50%, with values for smaller patients being up to 50% less than the organ doses for both CT scanners. The discrepancies occur because the size of the standard dosimetry phantom that was developed for a European-North American population is substantially larger than almost all Thai patients; in fact, only three patients in each of the groups of 120 patients were larger than the phantom. The relative CTDIvol values suggested that large patients received 3-4 times the radiation dose given to small patients on the GE scanner, but the SSDE values showed that the actual ratio between the two was only just over two as shown in [Table 3]. Values of image noise for standard size patients with AP + LAT measurements of 55 cm were similar for both CT scanners. The variation in patient organ doses for the Siemens scanner was much less, but the actual doses were higher. The average CTDIvol for the GE scanner was 33% less than that for the Siemens scanner. This was largely due to the availability of iterative reconstruction on the GE scanner since this allowed the noise levels required by the image quality reference setting to be achieved with lower mAs values. Values of CTDIvol were 2.5, 1.4, and 1.1 times higher in small, standard, and large patients for the Siemens scanner compared to those of the GE one as shown in [Table 3]. The large difference between the two scanners for small patients occurs because the Siemens image reference requires a lower noise level to be achieved and limits the reduction in tube current. The setting of a minimum tube current performs a similar function in the GE scanner. The Siemens scanner accepts a higher noise level for large patients, and here dose levels for the two scanners are similar. 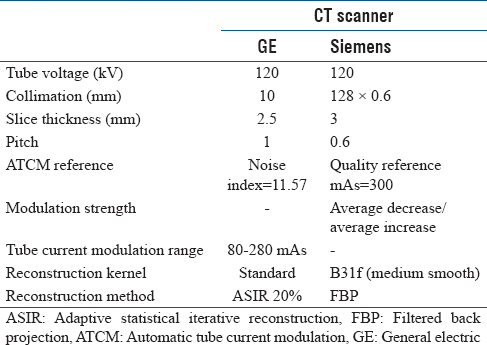 The ranges of tube current, CTDIvol and SSDE values with patient size were wider for the GE scanner than the Siemens scanner [Figure 2] and [Figure 3], as the CTDIvol increased with increasing patient size to maintain a constant noise level and image noise was actually found to decrease with patient size as shown in [Figure 4]. Thus, the GE ATCM system may overestimate the mAs required to maintain a constant noise level for larger patients. A higher target noise setting (NI 12.1–13.3) is now included in the optimized clinical scanning protocols for larger patients to avoid the higher dose levels. The mAs increased less for bigger patients, and the data were more scattered for the Siemens ATCM system since it aims to achieve an image noise level similar to that for a reference-stored image and maintain a similar level of image quality for all patients. This avoids the dose levels for large patients being substantially greater while enabling full use of current modulation for patients of all sizes and results in a smaller variation of tube current with patient size as shown in [Figure 2]b and lower doses for larger patients. The study calculated the mean absorbed doses for organs covered by the primary beam such as the liver, stomach, and kidney. The results show strong relationships (r2 > 0.99) between SSDE and calculated organ doses as illustrated in [Figure 5], the ratios of the SSDE and the organ dose were close to 1:1, confirming that the SSDE can be used to predict the organ absorbed dose. However, there are uncertainties in the calculation of the SSDE, relating to the error in the measurement of patient size. 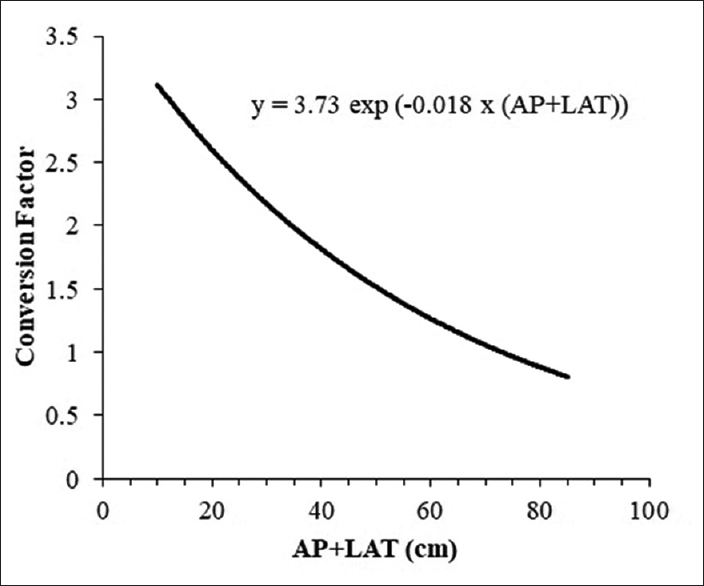 The values of SSDE could vary by ± 6% with the range in AP + LAT dimension within the middle of the scan field. The AAPM recommend measuring patient dimensions at the center of the scan region, but the accuracy achieved will depend on the diligence of the technologist or radiologist performing the measurement. There are some limitations to the study. First, data for only adult patients were evaluated, and the majority of the patients were small in size, representing a typical population group in Thailand. Second, data were collected from only one CT scanner of each manufacturer. Finally, there might be personal bias since all AP and LAT dimension measurements were made by one observer. Results of the study show that there is a strong relationship between patient size and CTDIvol for both CT scanners. However, conversion of the CTDIvol to the SSDE shows that the actual doses to the organs of the patients are 20%–50% less than the CTDIvol values and do not decline to the same extent with patient size. This occurs because the standard phantom is not representative of individuals within the Thai population. The agreement is closer for larger patients, but becomes significant for smaller ones. When doses for patients with AP + LAT measurements of 45 cm and 65 cm were compared, the ratio of CTDIvol values for the GE scanner was 3.7, whereas the ratio of the SSDE values was only 2.4, so variations in the CTDIvol give a false impression of the actual differences in doses to the patients' organs. The differences for patients scanned on the Siemens scanner were substantially smaller, and SSDE values for larger patients were <20% higher than those for small patients. Image noise from the Siemens scanner increased with the patient size, but image quality was still maintained at an acceptable level. The ratio between SSDE and absorbed dose to various organs was about 1:1 for both CT scanners under investigation demonstrating that the SSDE provides a realistic assessment of doses to tissues lying within the primary beam. The authors would like to thank Ms. Arunrak Surarit and Mr. Kanlapaphat Temphon for their help in data collection. International Electrotechnical Commission. Medical Electrical Equipment – Part 2-44: Particular Requirements for the Safety of X-Ray Equipment for Computed Tomography. Geneva: IEC; 2002. McCollough CH, Leng S, Yu L, Cody DD, Boone JM, McNitt-Gray MF, et al. CT dose index and patient dose: They are not the same thing. Radiology 2011;259:311-6. Huda W, Mettler FA. Volume CT dose index and dose-length product displayed during CT: What good are they? Radiology 2011;258:236-42. American Association of Physicists in Medicine. Size-Specific dose Estimates (SSDE) in Pediatric and Adult Body CT Examinations: Report of AAPM Task Group 204. College Park, MD: American Association of Physicists in Medicine; 2011. Lee CH, Goo JM, Ye HJ, Ye SJ, Park CM, Chun EJ, et al. Radiation dose modulation techniques in the multidetector CT era: From basics to practice. Radiographics 2008;28:1451-9. Martin CJ, Sookpeng S. Setting up computed tomography automatic tube current modulation systems. J Radiol Prot 2016;36:R74-R95. Iball GR, Moore AC, Crawford EJ. A routine quality assurance test for CT automatic exposure control systems. J Appl Clin Med Phys 2016;17:291-306. Söderberg M, Gunnarsson M. Automatic exposure control in computed tomography – An evaluation of systems from different manufacturers. Acta Radiol 2010;51:625-34. Turner AC, Zhang D, Khatonabadi M, Zankl M, DeMarco JJ, Cagnon CH, et al. The feasibility of patient size-corrected, scanner-independent organ dose estimates for abdominal CT exams. Med Phys 2011;38:820-9. Sookpeng S, Martin CJ, Cheebsumon P, Pengpan T. Practical experiences in the transfer of clinical protocols between CT scanners with different ATCM systems. J Radiol Prot 2017;37:84-96. Sookpeng S, Martin CJ, Gentle DJ. Influence of CT automatic tube current modulation on uncertainty in effective dose. Radiat Prot Dosimetry 2016;168:46-54. Noferini L, Fulcheri C, Taddeucci A, Bartolini M, Gori C. Considerations on the practical application of the size-specific dose estimation (SSDE) method of AAPM report 204. Radiol Phys Technol 2014;7:296-302. Brady SL, Kaufman RA. Investigation of American association of physicists in medicine report 204 size-specific dose estimates for pediatric CT implementation. Radiology 2012;265:832-40. Christner JA, Braun NN, Jacobsen MC, Carter RE, Kofler JM, McCollough CH, et al. Size-specific dose estimates for adult patients at CT of the torso. Radiology 2012;265:841-7. Vorona GA, Zuccoli G, Sutcavage T, Clayton BL, Ceschin RC, Panigrahy A, et al. The use of adaptive statistical iterative reconstruction in pediatric head CT: A feasibility study. AJNR Am J Neuroradiol 2013;34:205-11. Sookpeng S. Investigation of CT Dosimetry Techniques for use in Optimisation of Automatic Tube Current Modulation (ATCM) Performance. Glasgow: University of Glasgow; 2014. Kalra MK, Brady TJ. CARE Dose 4D: New techniques for radiation dose reduction. SOMATOM Siemens Healthcare Website; 2006. Available from: http://www.medical.siemens.com/siemens/de_DE/rg_marcom_FBAs/files/news/CT_Dose_Reduction/DoseReduction_Sessions_19_RSNA_DRUCK.pdf. [Last accessed 2013 Dec 18].